Two massive fires in Jerusalem, one in Afula, day after three set the capital ablaze; suspicions of arson terror. In what is becoming a daily event, large fires broke out in Jerusalem on Thursday, the latest in a recent wave of suspected arson terror attacks that included three fires in the capital on Wednesday. Massive fires broke out in two separate points in Jerusalem Thursday: one began in a thorn field in the south-western neighborhood of Kiryat Hayovel and rapidly began approaching homes. Five firefighting crews were dispatched to fight the blaze, reports Yedioth Aharonoth. In a separate, simultaneous incident, a large fire broke out in a thorn field in the Har Hotzvim neighborhood in the north of the capital, where much of Jerusalem's hi-tech industry is located. After an intense battle with the flames, firefighting crews succeeded in gaining control of the fire in Har Hotzvim. In Kiryat Hayovel, the crews managed to distance the approaching massive fire from the line of homes in the neighborhood. Shortly afterwards it was reported that five firefighting crews were engaged with a fire that broke out in a forest in the Givat Hamoreh neighborhood of the northern city of Afula. Four homes in the Afula neighborhood were evacuated due to the smoke, and police forces in the area are directing traffic in order to aid access for firefighting vehicles. Yedioth Aharonoth notes that a month ago five apartments were burned in the neighborhood and dozens damaged after a fire broke out among the houses. Many have connected the dots on the numerous fires in recent days, suggesting that Israel has come under a wave of Arab arson terror. That wave escalated on Wednesday as an Arab youth in Jerusalem was found burned to death after having been abducted. Despite wide accusations of Jewish "revenge" after the murder of the three Israeli teens, a senior former police official familiar with Abu Khder's family told Arutz Sheva it was a family with a long police record, known for violent internal clashes, adding "I have no doubt that as time passes it will be clarified that the murder was criminal and nothing more." In a little-noticed report on Channel Two Wednesday night, reporter Moshe Nussbaum cited contradictory statements by the youth's parents, who both told police different stories about another attempted kidnapping – that of Muhammad's nine year old brother – that may or may not have taken place. During the ensuing riots in Beit Hanina and Shuafat after the announcement of the murder, several Arab residents reportedly attacked a young local Arab, possibly indicating the internal clashes the source spoke of. The fires come exactly one day after multiple large fires broke out in western Jerusalem on Wednesday, one point being at a plastics factory in the moshav of Even Sapir, burning down three homes in Ein Kerem and evacuated the nearby communities of Ora and Aminadav. An additional brushfire broke out in the Sansan forest preserve near Tzur Hadassa, close to Beitar Illit, and another near Lifta, a nature preserve and historical site just ten minutes from Jerusalem's Central Bus Station. Last Wednesday, a massive forest fire broke out in the same area in the Jerusalem forest to the south-west of the city; residents of three streets were evacuated from their homes, as well as several public institutions, including Hadassah Ein Kerem and the Yad V'Shem Holocaust Memorial Museum. The following Thursday, two more fires broke out, one in Jerusalem's Har Hotzvim and another right by the city of Karmiel in the Western Galilee. That same day the arrest of a 20-year-old Arab resident of Abu Ghosh to the east of Jerusalem, who confessed to setting a forest in the area on fire, was extended. 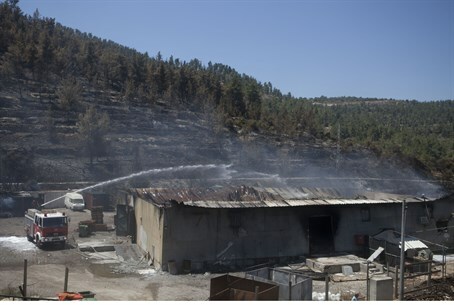 The fires continued on Shabbat (Saturday) morning, as a suspected Arab arson attack was put out at the last moment before it reached the Jewish community of Einav in north-west Samaria. "Who is burning our country every year? Why isn't it spoken about? Who's hiding the nationalistic crime?" asked Ben Ari. "Graffiti has been declared as terrorism, what about burning forests next to residential buildings? Is the Shabak (Israel Security Agency) investigating who is behind the fire terrorism, or are they busy with a girl who had chalk in her schoolbag?" asked Ben-Ari rhetorically, referencing the high profile responses to "price tag" vandalism.